It's habit. "Sales & Marketing." It's simply what we call it. All of us. And habit and repetition make it fact - "fact" pregnant with whatever connotations each of us imbues it with. The problem is that the B2B world associates the term with a traditional model which is decreasingly effective. But as long as we persist in using the term, all discussions around strategies and tactics to improve results will be interpreted in the context of the model which is inexorably linked to the term casually and reflexively used. Industrial marketing used to be an internal function - and generally one which was accorded somewhat less prestige and importance than its "sales" sibling. Certainly competitive analysis, pricing, product marketing, product road maps and other functions were and remain valuable and necessary. But often, particularly in SMBs, marketing was viewed as arranging trade show participation and details, planning direct mail campaigns and designing magazine ads. Of course there were some brochures and presentations to design and an occasional video to produce. But all of that was oriented around providing the tools to the sales team - the beans and bullets to the front line warriors. There was a time when the direct sales team really controlled the sales process. They were the repository of information which wasn't otherwise available to prospects and buyers. Of course we all know that has changed. We understand it intellectually - of course the availability of information on the internet doomed the rainmaker juggernaut. And we understand it emotionally - each of us who is responsible for growing business profitably simply feels that it's different, and potentially harder than it used to be. Now there's less and less selling and more and more buying. Buyers manage the process according to their terms - and statistically are loathe to speak to a rep until they are 70% of the way through their buying process. But buyers still go through the same process - perhaps even a more extensive process than they used to. And if they aren't navigating that process with a direct sales rep as their pilot, then they are doing it on their own using the results Google serves as their map. That means that "sales" now increasingly happens virtually. Many of the same steps still occur (bonding and rapport as credibility building; needs assessment as problem research; competitive comparison and budget throughout the process) but they happen in private. Sellers have none of the traditional interactions by which to gauge their position. 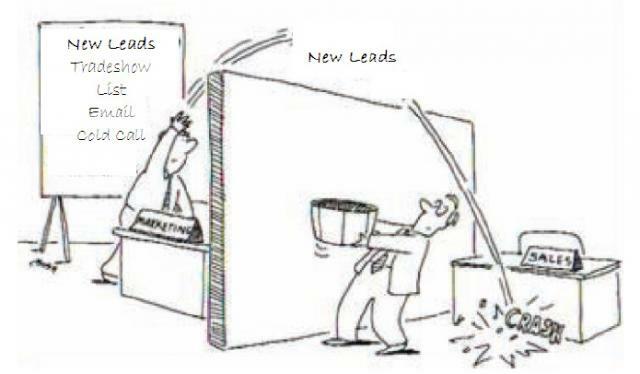 The problem is that the sellers still assume they are selling once they have active leads...and the marketers still think their role is to generate early stage leads. And the bulk of the sales/buying process is falling into no-man's land between parochial and traditional marketing & sales stovepipes. There's a straightforward solution. When you sit down to work on your annual budget and someone suggests incremental adjustments to "Sales & Marketing" throw the BS flag. Stand up and manage. Take the organization through the process of divorcing your critical business development process from a dysfunctional and outdated model, and embrace an approach which mirrors today's buying habits. It's really a bit of marketing research which informs a sales continuum. Much of that B2B sales continuum is virtual and digital (whether that feels comfortable or not.) But each buyer is different and today's superb sales folks understand instinctively how to engage at what point in the process, to complement the buyers experience. If you've got a team of brochure designers and cold calling direct reps you may struggle. If you've got savvy, intelligent, strategic-thinking team-players then you have the required building blocks who need guidance and direction. But whether you have the right team now or not, buyers have changed their behavior. Simply referring to your growth function as "Sales & Marketing" disregards the change as well as the adaptation required of your business. Change your language, change your behaviors and change your business fortunes....or not. Your call.